The time has come, fellow nerds. The comic book movie event of our lifetimes has finally arrived. On April 27, AVENGERS: INFINITY WAR hit theaters, giving fans the epic showdown they have always dreamed of. The Mad Titan has invaded Earth, forcing the Avengers to reunite to face this cosmic threat. To be honest, I think I have been waiting for this film since I was a kid watching the old Spider-Man animated series. 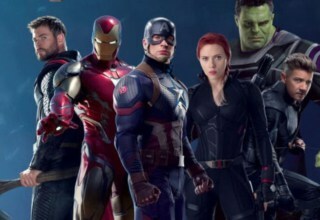 The idea that all of my favorite characters have invaded the big screen together feels nothing less than unfathomable. But it has happened, and I couldn’t be any more excited. AVENGERS: INFINITY WAR has been a long time coming and has taken its influences from comics dating all the way back to 1991. Since then, storylines and major events have come and gone. The Marvel Universe has faced several hopeless fights, only to come out the victor in the end. With so many stories to inform your INFINITY WAR viewing experience, it can feel overwhelming to approach these important comic books. Where do you start with over 27 years of history? With that in mind, I have put together a list of some of the most important stories to keep in mind after you are blown away by the newest AVENGERS film. No list based on INFINITY WAR could be complete without mentioning the story that started it all. While Thanos made his first appearance in IRON MAN #55 in 1973, INFINITY GAUNTLET is truly his tour de force. This is the story that introduced readers to the madness and terrifying might of the Infinity Gems and Gauntlet. After traveling the universe and collecting the Infinity Gems, Thanos uses his new god-like power to wipe out half of the life in the universe. He does this simply to impress the physical manifestation of Death, who is the woman of his dreams. Even with the Avengers and the entire Marvel Universe gunning for him, Thanos ends their fight with a snap of his fingers. INFINITY GAUNTLET isn’t simply an important read to prepare for INFINITY WAR. It is one of the most important Marvel Comics ever written. This story captures the essence of the Cosmic side of the universe that still persists today. More importantly, though, INFINITY GAUNTLET paints a horrifying portrait of Thanos’ psychology. He is willing to do anything to impress Death. He wipes out half of the universe and killed his own mother, simply to draw her eye. That does not speak to a healthy mind and seeing that diseased psychology wielding the most powerful weapons in the universe is absolutely terrifying. This is especially true when you consider that nearly every Avenger, X-Man, and villain in the Marvel Universe makes an appearance only to fail at first. INFINITY is one of the newest stories on this list. It also has the potential to influence much of the plot of AVENGERS: INFINITY WAR. The story itself is a grand space epic, dealing with two fractured Avengers teams facing two grave threats. In the depths of space, Captain America, Ex Nihilo, Cannonball, Thor, and other members of the main Avengers team join various alien species in a war against an ancient race of destructive superhumans. Meanwhile, on Earth, the Illuminati, consisting of Beast, Dr. Strange, Mr. Fantastic, Black Bolt, Black Panther, Namor, and Iron Man, must put aside their world-saving mission to face down the newly arrived Thanos. However, Thanos isn’t working alone. Now without the Infinity Gems, Thanos has cobbled together the deadliest army in the universe, led by the Cull Obsidian, his generals. If you read nothing else on this list, INFINITY GAUNTLET and its 2013 successor INFINITY have to be your choices. Both of these stories are set to inspire so much of the film. In fact, the invasion of Wakanda takes direct reference from an event within INFINITY. However, INFINITY plays two more important roles. Firstly, it focuses on a less-powerful Thanos, one without the Infinity stones. Yet, he is still capable of razing Earth in his wake. This will be the Thanos we see at the start of the film. The other important introduction in this book, though, comes in the form of the Black Order. Renamed the “Children of Thanos” in the film, these dangerous and deadly villains make their first appearance in this story, just in time to take the fight to the MCU. AVENGERS #7-12 (2011) by Brian Michael Bendis and John Romita, Jr. Despite their long history in the comics, the Infinity Gems (as they are called in the comics) have never really gotten a clear explanation. Their powers typically evolved to fit whatever storyline they appeared in. Even though Thanos named the Gems in the original INFINITY GAUNTLET event, their true capabilities weren’t explored until Brian Michael Bendis’ run on AVENGERS in 2011. Bendis has a penchant for diving into the more obscure corners of Marvel lore. In many ways, he is as much a comic book lover as we are, meaning that he wants to explore those areas of Marvel that don’t have sufficient explanation. That is why, in THE AVENGERS Vol. 2, he delves into the history and powers of the Infinity Gems. In his run on AVENGERS Vol.2 in 2011, Bendis centered an entire arc on these powerful little rocks. Mystical villain The Hood escapes from prison and goes on a crime spree around the world to acquire the Infinity Gems for himself. Along the way, he manages to not only find the whole collection and explore their powers; he also manages to expose the darkest secrets of the Illuminati to Steve Rogers. The ensuing interpersonal conflicts threaten to tear apart the Avengers. Not only does Bendis’ run give more weight to Thanos’ powers in INFINITY WAR; it also plays with the same emotional battles going on in this post-CIVIL WAR world. 2015’s SECRET WARS is a sign that weird can sometimes be amazing. Different versions of Earth from the Multiverse were colliding, destroying the inhabitants of each. When it eventually reaches Earth-616, the fight is almost lost. In the end, there are only two universes remaining in the once-infinite multiverse. 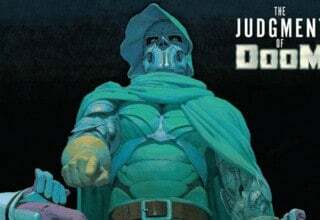 Instead of succumbing to his fate, though, Dr. Doom absorbed the power of the Beyonders, a group of god-like beings. He used their power to build Battleworld from the myriad pieces of dead universes. What then ensues is a GAME OF THRONES inspired throwdown between God-Doom and the survivors of the old worlds. The original SECRET WARS (1984) is deeply important in its own right. In many ways, it is considered the first major superhero crossover event. However, in a discussion about an INFINITY WAR reading list, it has almost no bearing. Its sequel from 2015, though, has a great deal of significance. Not only is the cast absolutely massive, it deals with multiversal versions of everyone’s favorite Marvel heroes. It also showcases the utter power of the Infinity Gems. In one of the series massive battles, Black Panther uses the Infinity Gauntlet to attempt to dethrone the God-Powered Dr. Doom. Doom struggles against the weapon, but he does not fall. On the one hand, the resulting battle showcases the utterly unstoppable might of the Gauntlet. On the other, it shows that the Gauntlet can also be beaten. The first entry on this list not to focus on Thanos or the Infinity Gauntlet, ANNIHILATION may just be the most important story on this list. Prior to this cosmic event, the realms of outer space in the Marvel Universe resembled nothing of what we see today. The Guardians of the Galaxy did not include any of the roster we know and love. The Nova Corps was largely an unexplored idea. ANNIHILATION changed all of that. Most of what we know of the cosmic side of Marvel comics is based solely off of this mini-series. This means that despite not showcasing the Gauntlet, ANNIHILATION has had the biggest effect on the events leading up to INFINITY WAR. With so much importance, you should know that this is a rather long series. While the base mini-series only ran for six-issues, several four-issue tie-in series and a lengthy sequel are required to get the full experience. However, it is worth it to see the epic space-faring war take place. The story introduces Annihilus, one of the biggest threats in Marvel Cosmic history. A warlord of the Negative Zone, Annihilus has put together a massive armada of spaceships set to conquer the Marvel Universe. 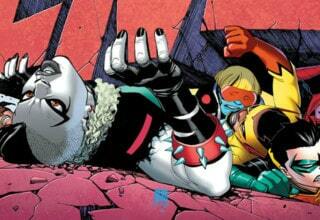 With such a grave threat, all of its space heroes and villains must band together to stop him. What results is a space-war to rival STAR WARS, with superpowered beings taking center-stage in explosive combat. It is epic, but it is also so important to understanding the Cosmic influences on INFINITY WAR. In 2014’s ORIGINAL SIN event, Thor Odinson became unworthy to wield his hammer, Mjolnir. For a character so completely defined by his weapon, this event shocked readers and Thor himself. THE UNWORTHY THOR opens on this bereaved god. 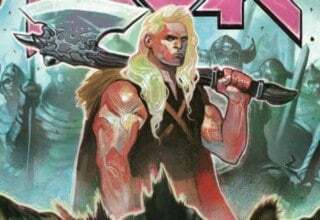 Taking place largely in Marvel’s cosmic realms, the story follows the Odinson as he travels the universe looking to find a new weapon. While fighting trolls on the moon, he hears a rumor that the Collector has found a new hammer, one forged in a dead universe. Together with his Hel-Hound Thori, his giant goat Toothgnasher, and his ally Beta Ray Bill, Thor goes on a journey to take this hammer back and reclaim his godly title. THE UNWORTHY THOR has several important connections to INFINITY WAR. It even has the potential to influence Thor’s entire plot arc in the film. In INFINITY WAR, Thor’s journey with Rocket Raccoon and Groot involves the God of Thunder trying to find a new hammer called Stormbreaker. THE UNWORTHY THOR also features an appearance by the Black Order as they attempt to steal the hammer for themselves. This story is so much more than simply a Thor story. It is an exploration of modern cosmic Marvel unlike anything we have seen in a long time. I tried to cut this entry down to just one or two story arcs from the Marvel Now GUARDIANS OF THE GALAXY series (2013). However, the entire Brian Michael Bendis run on the series is so important to the context of INFINITY WAR that it cannot be ignored. In the first 25 issues of this series, Bendis takes readers on a roller coaster ride throughout space. One of the biggest influences comes from the fact that Iron Man joins the team at the beginning of the arc. The relationship between Tony Stark and the Guardians actively inspires the banter and characterization going on in the film. There are even two important INFINITY tie-in issues in these collections. However, the single biggest reason to read these issues is the way it paints the team’s connections to Thanos. Prior to this series, Star-Lord, Drax, and Thanos were presumed dead. They had transported themselves into the “CancerVerse” to keep the universe from being destroyed. In flashbacks throughout this series, we explore each of these character’s connections to the Mad Titan. We see the influence he has over the universe around him, even without his famed Gauntlet. What we eventually discover feels terrifying. Thanos may be mad. He may be incredibly powerful. However, above all else, he is a manipulative genius. That kind of intellect will shape a lot of the character’s screen appearance, leading to an overall terrifying villain to face. Of all the stories on this list, THE THANOS QUEST is definitely the shortest. A two-issue miniseries, this story follows the Mad Titan as he travels the universe in search of the Infinity Gems. This story acts as a precursor to Starlin’s three consecutive Infinity Gem based stories: INFINITY GAUNTLET, INFINITY WAR, and INFINITY CRUSADE. For that reason alone, this story should seem essential. It helps dictate the events prior to one of the greatest Thanos stories ever. And it does this in a way that mirrors contemporary fantasy. It puts Thanos through a dark hero’s journey, in a way, as he battles with the most powerful forces in the Marvel Universe. This story is essential for so many reasons. Not only does it show how Thanos learned about and collected the Gems; it also showcases his motivations in a brilliant short-form story. We learn about his obsession with Death and his drive to win her favor. However, the real driving force of this story comes from the fact that Thanos isn’t yet omnipotent. This is his journey to gain that godly power, making his quest somewhat terrifying. This character is capable of so many horrendous acts of power without the Gems. More importantly, this story doesn’t take long to read. It isn’t a major time commitment to page through about sixty pages, and you really do get so much in that span of time. At the time of this writing, the NO SURRENDER event just finished with AVENGERS #690. This makes the story the newest on this list, and also one of the few not to focus on Thanos. Rather, it joins this list for several other important reasons. First and foremost, this is a brilliant text to read in order to learn more about the Black Order. The story follows an extra-planetary game played by the Grandmaster and his Challenger. Each player has chosen a team to back, with the Black Order representing the Challenger. Through the ensuing fight sequences, we see the vast and nearly unstoppable power of these generals of Thanos, and it gives readers pause as to the Avengers’ chances in INFINITY WAR. 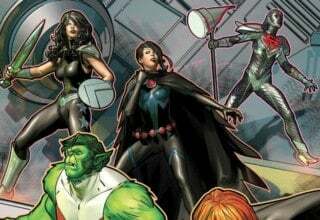 However, the most important aspect of AVENGERS: NO SURRENDER comes from its focus on the superhero team. The story explores what it means to be an Avenger and what they mean to the world. The title should say it all. In the face of the impending cosmic throwdown, the Avengers refuse to surrender. The story gives hope to readers and shows exactly why we have fallen in love with these heroes time and again. Even the least among the team make a massive difference. We definitely know that it will take every Avenger to take Thanos down in INFINITY WAR, and this is a good place to see what that might eventually look like. While Donny Cates’ entire run on THANOS could be included in this list, the third volume of the series carries a greater impact than the others. Titled “Thanos Wins,” this volume explores the deepest depravities that Thanos has ever committed. Following the Mad Titan on a time-traveling journey, we witness him venturing to the end of time. Here, Thanos has finally won. He sits on a throne above all Creation, his goals finally complete. While I do not want to give anything away, the vision of darkness that you see will send shivers down your spine. While we get a clear vision of Thanos’ motivations in other stories, very few actively focus on them like “Thanos Wins.” By getting to see how he got to where he is, readers see Thanos in a new light. We see every single one of his past and future victories, as well as the things he had to sacrifice. While this story showcases an all-powerful being, we also see a more human side to the character. It is said that Josh Brolin’s Thanos will face a true character arc and quest in INFINITY WAR. Hopefully, the Russo Brothers have taken a page out of “Thanos Wins” to construct a more relatable version of this powerful character. Marvel movies are known for their references, and it takes a veritable doctorate in comic book history to understand them all. While I cannot list every single story that may influence AVENGERS: INFINITY WAR, there are a few that I’d like to give a quick mention to. These are the stories that have some connection to the events in the film but nothing truly major. Also note that most of the above stories take place on very cosmic scales. However, the following stories follow more of the individual Avengers. If space-faring narratives do nothing for you, then these might be better picks. Tom King is well known for his deep, psychological storytelling, and VISION is no different. In this story, the loveable cyborg finally dives into his obsession with normality by building himself a family of fellow cyborgs. INFINITY WAR promises to focus a great deal on Vision, considering that he has an Infinity Stone in his forehead. It also focuses quite heavily on the Scarlet Witch/Vision relationship. This is the story to read to truly understand these events. The story is also just incredibly good, focusing on the strange psychology of being an artificial human. If you’ve seen INFINITY WAR, you may have noticed that Scarlett Johanssen’s Black Widow has a new blond haircut. While this may seem like nothing more than an aesthetic change, it actually has some roots in the comic books. 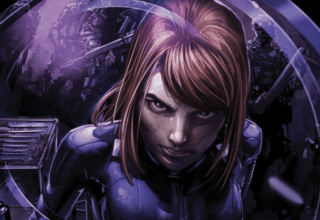 BLACK WIDOW: THE ITSY BITSY SPIDER represents the first time that the Black Widow had this hairstyle. Mind you, I doubt that the Russo Brothers will be focusing too heavily on this source material. After all, adding in a new plotline focused on rival Russian spies may slightly overwhelm the grand cosmic warfare. Rumors have floated around the internet recently that Brie Larson’s Captain Marvel will make a brief appearance in AVENGERS: INFINITY WAR. Whether or not this is true, the implications of her inclusion could shift the balance of the fight towards the Avengers. After all, Captain Marvel is one of the most powerful heroes in the Marvel universe. In order to prepare for this possibility, you need to read THE DEATH OF CAPTAIN MARVEL. While it does not focus on the Carol Danvers version of the character, it does showcase some of her origins, as well as her predecessor. Also, this story is also one of the most important comic books ever written, so you gain some nerd cred for even buying this book. While CAPTAIN AMERICA: CIVIL WAR has come and gone from the MCU, its implications still play a role in INFINITY WAR. Take, for example, Spider-Man’s decision to side with Tony Stark and Doctor Strange on their space-faring journey. Now, if you have seen the film or watched the trailers, you may have noticed that Tom Holland is wearing a brand new set of super-duds in this film. This suit takes its inspiration from the Iron Spider suit that made its first appearance in AMAZING SPIDER-MAN: CIVIL WAR. To better understand this technological marvel or to simply see behind the scenes of the CIVIL WAR storyline, you need to read this book. Of these honorable mentions, this might just be the most important. With rumors floating about that someone important will die in INFINITY WAR, this particular post-CIVIL WAR arc may be our best sign as to who that might be. After all, Chris Evans’ contract is ending soon, meaning that the First Avenger may not make it out of this fight. However, as we discover in this story, there is still hope. Another man picks up his title as this story arc continues. Bucky Barnes quickly becomes the newest Captain America. Even if Chris Evans does agree to leave the MCU, I would love to see Sebastian Stan pick up the mantle and become the next Captain America. Whether you see AVENGERS: INFINITY WAR today or weeks from now, these are the stories that shaped your viewing experience. Some are more important than others in terms of their influence. However, each and every one has its role to play. Even if you never see the film, these are some of the most important Marvel story arcs to ever be written. Your life could only be better by adding these fantastic narratives to your personal libraries. Previous article The Black Order: Who Are They and What Can They Do?